Coraline is a Children’s horror film and, unsurprisingly, has been quite controversial within parental forums with some arguing it is too scary for it’s PG rating. The Nightmare Before Christmas – also directed by Henry Selick – provoked a similar reaction yet is a firm family favourite with a strong cult following. It’s very different from a regular children’s film, which may account for its success. 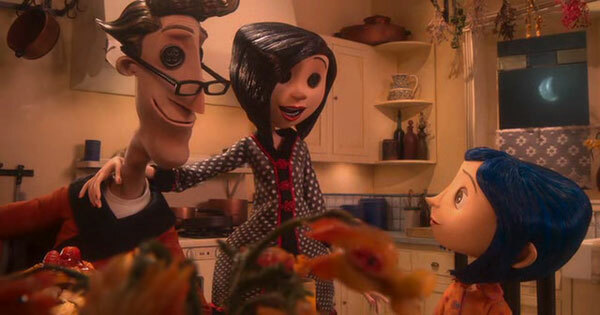 Likewise Coraline is a refreshing break from the same-old same-old and pushes the envelope on children’s entertainment. It’s frightening in a surreal, psychological way evocative of nightmares with a sprinkling of creepiness. But by embodying these intangible childhood fears it also tackles how to deal with them, and is ultimately empowering and uplifting. Coraline is a stop-motion animation and the hand-crafted feel is particularly appropriate to its theme. With the introduction of computer-generated animation stop-motion, which is a painstakingly slow process, is becoming increasingly rare. Coraline’s visuals are breathtaking with minute attention to detail in every frame. It’s a work of art with beautiful, atmospheric scenery and luscious, touchable textures. I could forgive a multitude of sins for something this pretty. The addition of a boy to the story was a good call in my opinion – it gives Coraline someone to explain things to and the audience needs that. Though personally I hate his name ‘Wybie’ because it seems too extraordinary for the ordinary world. Likewise making Mr. B an acrobat adds too much credence to his claims of creating a mouse circus. It betrays the concept slightly by making the real world a bit too bright and interesting. Why would the Other World’s spectacles tempt Coraline when her real world has spectacles to rival it? But, nit-picking aside, this is a beautifully crafted, very original and enjoyable film. And if you have kids you should let them go and see it! Fun Stuff: You can get bendable Coraline dolls whose faces are interchangeable enabling you to create your own Coraline stop-motion animation like this one on YouTube. If I had the money to spare I would so be getting these. Uh, I don’t suppose you want to buy me a present? If you enjoy my stuff why not follow me on twitter?